These are from "Acceleration Zero"
These sounds are © 1998 Tomatohead Records and are being used only to promote Blindspot's music. If you like what you hear here, please take a trip to the Tomato Head page and put $10 in an envelope and try the whole album! These are from the Maude 7"
These are in Real Audio Format. 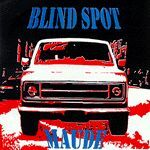 This is from the Blindspot 7"
This is in Real Audio Format.